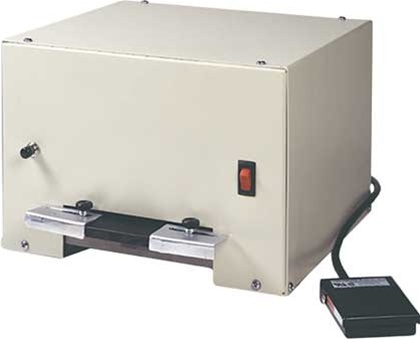 Item#:3943-1600 - This electronic slot punch is ideal for organizations that are looking for a better way to punch their ID badges and access cards. The foot pedal switch allows you to use both hands for feeding and stacking cards. That means higher productivity and with this unit you won't need to worry about repetitive stress injuries that can occur with heavy duty manual machines. This unit can handle ID cards that are up to 70mil thick and has adjustable centering guides that will allow you to place the slot on your cards with precision. This machine is commonly used for industrial applications and inside large organizations that produce thousands of badges per year.